Though John’s is more than happy to repair your pipes, water heater, or any other pipe-related issue, we are not certified to perform water damage restoration. But the nature of our work means we know related-industry people in high places who we can recommend to take over where we leave off. Each job requires a different set of skills. So, if you’re ever in need of water damage services related to plumbing, just ask us if we know any reputable companies in the area. Whoever you choose should have specialized equipment and highly experienced technicians to carefully restore your home or business from water damage. Lakewood residents are fortunate to have plenty of choices. Water damage is an emergency and the company you choose should be available 24/7, 365 days a year. Water can damage not only damages the structure, but also furnishings, flooring, cabinetry, etc. And if not thoroughly dried, it can potentially lead to mold growth. 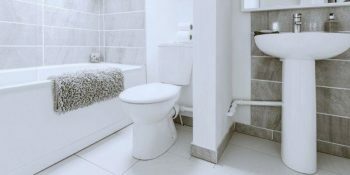 If the damage is related to plumbing, call John’s immediately to mitigate the damage. Then we can help you begin the process of restoring your home or business back to pre-loss condition. How does a professional respond to water damage from a burst pipe, water heater, or drain backup? Emergency Response. When you call the service, they generally can get to you within two to four hours. Water Removal and Drying. They thoroughly extract the water from carpeting, furniture, and other affected items. This is followed by using powerful air movers and dehumidifiers to begin the drying. The technicians closely monitor the entire process to ensure they are being as efficient as possible in returning your property back to its original condition. Reinstallation and Cleaning. This step involves returning items that were removed for the mitigation, and meticulously cleaning and deodorizing the structure and all of your belongings. Water restoration technicians undergo in-depth training on water damage restoration. The work they provide has helped thousands of local residents recover from water damage. Your restoration company should offer fast service for any size disaster. They should have technicians and service vehicles at the ready for quick response to any water damage or mold. Your specialists should be highly trained. Each member of the team should go through rigorous training and certification. They should provide continuing training to their technicians to keep them up to date on the latest processes, products, and procedures for restoring homes and businesses from water damage. Don’t be afraid to compare. Ask a few different companies about their use of water evacuation, drying, and dehumidifying techniques. You can also ask whether they have advanced moisture detection capabilities that allow them to find hidden spots that are still wet. The cutting-edge cleaning and sanitizing agents they utilize ensure that your structure and contents will recover from the plumbing disaster.